Last year I had a big health scare, but miraculously, it “disappeared.” This was a follow-up, so there was cause for concern. Instead of worrying and thinking of all the terrible possible outcomes and consequences, I made a whole-hearted effort to be as joyful as I could be, in spite of my underlying concern—laughing, singing, dancing, thinking of all kinds of exciting plans and REALLY enjoying special moments—holding onto them and letting them make a deep and lasting impression on my mind. I even took a 2-day vacation to the beach. I enjoyed lots of seafood—too much to feel comfortable afterward, (but I still had to have gelato! 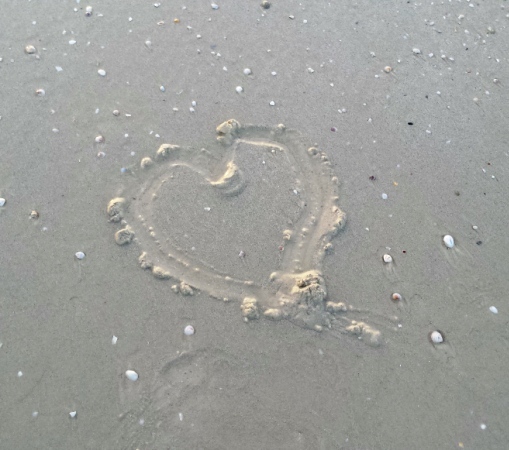 ); I walked on the beach at sunset, stared out into the Gulf’s blue-green surface, had colorful tropical cocktails, waded in the water as the sun rose, and drew hearts in the sand. No matter, I know that I am REALLY living in the moments as much as I can. I have so many blessings and am filled with such gratitude for all of them. That’s gaining The Inside Advantage. That’s all we can do—make the most of our moments as best as we can. That’s all we can expect of ourselves. Isn’t that what life is all about anyway? This entry was posted in The Mind, Wellness and tagged attitude, Cathy W. Lauro, finding joy, lab test results, living deeply, living in the moment, mind body, no worries, The Inside Advantage, wellness. Bookmark the permalink.